← Big Finish Celebrates – Day 5! 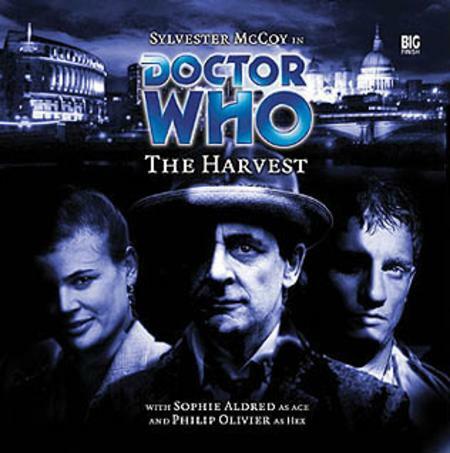 Sylvester McCoy is the Doctor in The Harvest. Introducing new companions is always a tricky proposition. A Doctor is sometimes defined by his companions, from Barbara and Ian to Clara Oswald and all the Jamies, Liz Shaws, Nyssas, and Captain Jacks in between. Sometimes, a companion’s introduction goes smoothly and they become a welcome part of the TARDIS crew for both the Doctor and the viewers. Sometimes…well, sometimes you get a Dodo or a Kamelion. Introducing a new companion into the audio continuity is even trickier. The television series laid out which companions travelled with which Doctor. Five has Nyssa, Adric, Tegan, Turlough, and Peri. Six had Peri and Mel. Seven had Mel and Ace. Eight had Grace Holloway. In the case of the Eighth Doctor, it was easy to introduce Charley, but for the other Doctors, adding an original companion to a group that has been firmly set in “official” continuity constitutes a big risk. There’s a chance the established chemistry between characters (and actors) could be thrown off. A new companion could overshadow the existing companion and maybe even the Doctor. Or, worst of all, the companion just may not click with the Doctor no matter how hard the actors or writers try. For the most part, Big Finish has seen positive results from adding new, original companions throughout their monthly range. Evelyn Smythe was the first companion, meeting up with the Sixth Doctor and instantly hitting it off in The Marian Conspiracy, becoming one of Big Finish’s most beloved characters. Storm Warning gave the Eighth Doctor his first proper long-term companion with Charlotte “Charley” Pollard, Edwardian adventuress, with a story-arc that spanned all of time and space, in this universe and beyond. The Fifth Doctor and Peri were introduced to the Egyptian princess (and would-be Pharaoh) Erimem in The Eye of the Scorpion, becoming a surrogate sister to Peri and causing Five a few headaches in the process. Now, after over eighteen months since we last heard the duo, Seven and Ace are teamed up with a newcomer to both the TARDIS and to Big Finish. The Harvest see Seven and Dorothy “Ace” McShane doing what they do best; snooping around and causing mischief in the course of saving the day. Assisting them in their endevours is a young nurse Thomas Scofield, nicknamed “Hex,” as he discovers mysterious goings-on taking placed in a sealed-off floor of his hospital. 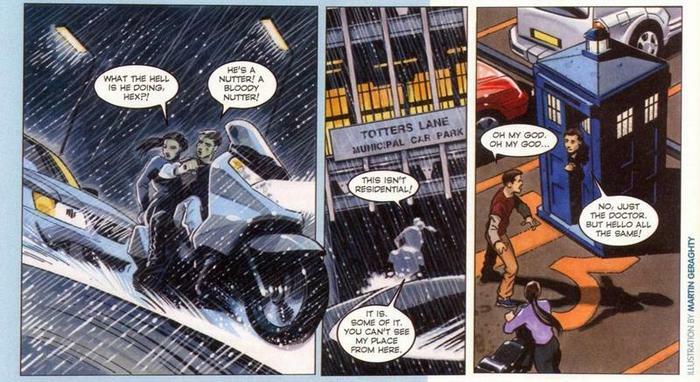 A quickly paced story that highlights the Doctor’s planning, Ace’s daring, and Hex’s “oh my God’s” against the plans of a long-time foe of the Doctor’s, The Harvest is a welcome return to form for Seven and Ace and a strong introduction for Hex. The last time Big Finish listeners had heard the adventures of the Seventh Doctor and Ace (not counting the “sideways” New Virgin Adventures audio The Dark Flame) was over twenty months prior to the release of The Harvest in the techno-tinged and not-very-well-received story The Rapture. Someone at Big Finish must have felt that Seven and Ace’s story needed a jumpstart, as the company brought in an accomplished author to pen their next story. Among British science-fiction writers, Dan Abnett is one of the best known as well as one of the most prolific. Since 1988, Abnett has penned hundreds of comic books and tens of novels. Some of his works can been seen in the seminal sci-fi comic 2000 AD as well as several Marvel comics including Nova and the crossover event War of Kings, best described as “Hey, kids, forget about the Sentry mess in Siege and come read a REAL storyline!” He’s also written scores of novels for Warhammer 40,000, Warhammer Fantasy and even a Torchwood novel. Landing Abnett to pen a Big Finish production was major coup for the company, and Abnett would go on from The Harvest to write several more audios of the Doctor’s adventures. The script does suffer from a bit of “first time audio writer’s blues,” as Hex does spend a good bit of time talking to himself and describing his surroundings. Beyond that however, Abnett has written a story that would have made John Nathan Turner proud; a singular creepy location is the setting for the majority of the audio’s runtime which features a lot of running around and being captured, as well as starring an old enemy of the Doctor’s. The script moves very quickly, always moving forward and refusing to drag its feet. Abnett also gives us several very well done cliffhangers. Episode one finds Hex freaking out inside the TARDIS and the Doctor (after being absent all episode, ala The Empty Child, calmly introducing himself. Episode three ends up with McShane and Mathias about to become part of the supply stock for the gruesome experiments via automatic surgeon. And episode two concludes with a quick escape while Ace urgently tells the Doctor the identity of their opponents; the Cybermen. It’s a Sylvester McCoy story, so there is shouting. But instead of the loud, brash Doctor seen in The Rapture, McCoy’s performance is more along the lines of his turn in The Fearmonger. When fans think of the Seventh Doctor, McCoy’s turn in The Harvest is incredibly close to the cunning, planning, scheming, lesson-teaching Doctor seen towards the end of his television run. The harshness that Seven shows towards Ace for getting Hex involved is tempered by the way McCoy delivers it, knowing full well getting other people involved is par for the course. You can sense the wry smile on McCoy’s face as he quietly manipulates the hospital’s central computers, revealing that he had been slowly changing the programming over the course of a few weeks to allow him accesses to everything, as opposed to just shoving a sonic screwdriver at it and hoping for the best. He comforts Hex as the young nurse realizes what’s happening at his hospital. And his fury and anger towards the experiments the Cybermen have been running turn to wonder and possibility, but then to pity and sorrow once he realizes the purpose behind them and how the Cybermen are doomed to fail. It’s easily McCoy’s best all-around performance since The Fires of Vulcan. When last we saw Dorothy “Ace” McShane, she was recovering from the shocking death of Feldwebel Kurtz in Colditz by being a Mary Whitehouse “don’t do drugs” teenage stereotype in The Rapture. Thankfully, Dan Abnett picks up from the end of Colditz and gives us an Ace who does her best to call herself, and get others to call her, McShane (or “Just McShane” in the case of Hex), as well as acting like a maturing, experienced traveler who still needs to learn a thing or two but is confident enough to trust in her skills and wise enough for the Doctor to include in his plans. From the end of the last serial of the classic series, Survival, through The Fearmonger, Dust Breeding, and Colditz we’ve seen Big Finish give Sophie Aldred a chance to break out of the wild-eyed and impulsive teenager she played on TV and let her have a hand at portraying someone a bit closer to her actual age, avoiding the uncomfortable and weird possibility of a 40-year old woman voicing a 17-year old explosives-packing miscreant. The Harvest sees McShane going undercover to work in St Gart’s HR department…in a serial that takes “Human Resources” to a whole new level…and using the position to poke around the hospital, the “boots on the ground” to McCoy’s “boots behind the desk.” Aldred plays McShane (I’m really trying to get used to writing “McShane” instead of “Ace.” Wish me luck) a bit closer to the Seventh Doctor, more mysterious and sneaky, though with a heavy dose of physical action, especially during the desperate rush about the hospital during the climax. It’s such a 180 degree turn from how we left her in The Rapture that also ranks, I feel, as one of Aldred’s best audio performances to date. I looked up Philip Olivier, the actor who plays Hex, and my first thought was “By E-Space, are those abs photoshopped?! ?” Olivier is best known in Britain as one of the many cast members of the soap opera Brookside and has since then appeared on a variety shows and as a model in several magazines. He’s a very, very, very pretty man, and I admit my second thought was “but can he act?” It only took a few minutes into The Harvest for that question to be answered with a firm, Scouse-accented “Aye!” Hex enters the story grounded, young with thoughts of that night’s birthday party in his head, uncomfortable at his friend’s attempts to set him up with several pretty young things. He’s not all confident, as seen when he realizes it’s his ex-flatmate on the operating table and pauses in the course of his medical duties, and he doesn’t just recover from the shock at the drop of a hat. Abnett’s writing and Olivier’s acting work very well together, giving Hex enough characterization (more than C’rizz has gotten in three stories at any rate) to define him, without giving away the whole store and answering all the questions about him in his very first appearance. Indeed, the Doctor looks up Hex’s history and gives us a quiet “interesting,” meaning there’s more to Hex than meets the eye. The biggest compliment I can give Hex is that he adds to the Seven/McShane dynamic instead of distracting or detracting from it. With McShane growing up a bit, Hex slides into the “young and shocked companion” role very well. I particularly enjoyed how he continued to freak out about how the TARDIS was bigger on the inside than the outside, and when the Doctor chided him for it, he shot back with a “I know what I see, and I accept it, I just have a hard time believing it response.” It’s refresher to see a new companion realize just how freaking insane the Doctor and his companions are as opposed to a gentle acceptance of how things work. With Hex taking charge as The Harvest rolls on, working on a bullet wound AND keeping someone alive during the climax, his urgency to join the crew of the TARDIS for further adventures is well understood and well played. The Doctor as the teacher, McShane as the graduate assistant, Hex as the new student…I definitely look forward to the next serial staring these three (Dreamtime) to see how their dynamic continues to unfold. The Harvest came out in June of 2004, so almost ten years after the fact I don’t think I broke spoiler protocol by revealing that the main villains of this story are none other than the Cybermen, making their third appearance for Big Finish after Sword of Orion and Spare Parts. The Cybermen are probably the best known aliens from Doctor Who after the Daleks. Hailing originally from the planet Mondas, the Cybermen traded their human emotions for cold, logical steel in order to survive that planet’s destruction. In The Harvest, Abnett takes the concept and turns it around in the opposite direction, as a group of Cybermen stranded on Earth commit what would be considered blasphemy if their race had such a concept in their databanks. William Boyde, best known as the EastEnder’s villain James Willmott-Brown, is Subject One, aka the Cyberleader, and was a great casting choice by Big Finish. The beginning of the story sees him experiencing wonder and revelation at the changes to his body, and as the story progress, that sense of wonder crystalizes into the same Cyberman doctrine that had defined the race for decades; everyone will be like them, and anyone not like them is a threat to the Cybermen’s survival, and the Cybermen will survive by any means. Boyde doesn’t take it over the top as previous Cybermen leads have, but keeps it very quiet, and very logical, which makes his performance even more chilling. The pair of non-Doctor doctors fulfill their jobs very well, Richard Derrington as the “I did it for science” Doctor Fareer and Paul Lacoux as the “no grace under pressure” Doctor Mathias. David Warwick is the typical government hatchetman these stories call for, and he does his job well…except when he’s seemingly channeling Dan Abnett’s feelings on the European Union, as he quote regulations, initiates protocols, and stands firmly on the receiving end of McCoy’s venting about bureaucrats and centralized governments. It takes way from the story in only just how much the anti-Eurocentric dialogue stands out. The sound work is of two minds. The techno-score and incidental music is very very late 80’s/early 90’s, but in a manner that’s overbearing and a bit grating on the ears. The background noise and special effects, however, in the hospital are top-notch, from the beeps and bloops of the casualty room to the harsh whirring and cutting noises in the cyber-surgey wing, and the screams and weapons fire during the climax, David Darlington does a solid job. But The Harvest is all about the introduction of Hex. Philip Oliver is the perfect addition to the Seventh Doctor and McShane’s TARDIS, adding a new voice and a new perspective on the Machiavellian machinations of the Doctor. There’s little doubt in my mind, going in unspoiled, that Hex will be part of several very good stories during his time with the Doctor! Synopsis – Combining a great introduction story for a new companion and a unique take on the Cybermen, The Harvest sets Dorothy “Ace” McShane, Hex, and the Doctor on a new and exciting path. 4/5. Next up – As the TARDIS materialises, with the Doctor determined to take full advantage of an invite to a cricket match, the catalyst that the dark forces need unwittingly arrives. Peter Davison is the Doctor in…The Roof of the World. This entry was posted in Big Finish Review and tagged 4/5, Ace, Big Finish, Big Finish Review, cybermen, Doctor Who, Doctor Who Audio, Hex, Philip Olivier, Seventh Doctor, Sophie Aldred, Sylvester McCoy, TARDIS. Bookmark the permalink. Put me down as a huge Hex fan. Olivier is great in the role and I really love the way he changed the TARDIS dynamic. I definitely put him and Evelyn at the top of the Big Finish companion list.